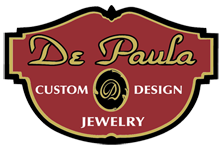 DePaula Jewelers has been creating custom made jewelry for over 40 years. We take great pride in our work, with each item handcrafted and guaranteed for quality. In our store, you will find an unmatched selection of estate and custom jewelry. We know you're unique, that's why our collection is too. Every item you find at De Paula Jewelers is an exclusive product. Come in to our store or contact us to learn more. We make jewelry buying and selling easy. At De Paula Jewelers, you can feel confident that you will walk away with the best quality, price and guarantee every single time. With four decades of service and quality, we are certain to surpass your highest expectations.